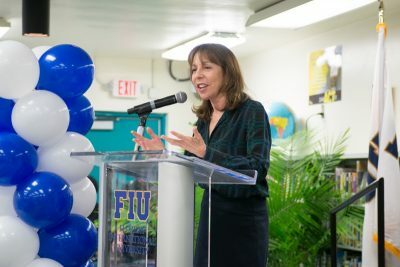 With a local philanthropist’s $2 million donation, the Education Effect, a groundbreaking partnership between FIU and Miami-Dade County Public Schools (M-DCPS) aimed at student achievement, is expanding into the historic Little Haiti community. The gift, the largest given to Education Effect, came from Rose Ellen Greene, a longtime volunteer at Jesse J. McCrary Jr. Elementary School. The expansion into McCrary Elementary marks the first time the program will be working with students, their parents and the community. Also, it will incorporate researchers, faculty and staff from FIU’s Center for Children and Families, a nationally recognized interdisciplinary clinical center committed to improving the lives of children and families. The Education Effect was first launched at Miami Northwestern Senior High School in Liberty City in 2011, and later expanded to Booker T. Washington Senior High School in Overtown. The program’s successes include supporting increased graduation rates from 64 percent to 82 percent at Northwestern, supporting both high schools in achieving a “B” grade from the state, and providing them with increased college credit courses. Over the next five years, Greene’s gift will fund a multidisciplinary team that will connect the school, students and parents with university expertise, resources and research-based programs that address pressing educational and social needs. That includes developing parent engagement programs, interventions by the Center for Children and Families, exposing children to college experiences, and professional development activities for teachers. Greene became familiar with Jesse J. McCrary Jr. Elementary when she and her daughter started volunteering at the school. Greene said she fell in love with the children and their energy. For the past five years Greene has dedicated many volunteer hours, reading to students, accompanying them on field trips and even having custom t-shirts made for them.